This breakfast would have to be one of the easiest and quickest breakfasts to make, especially in your thermomix! Almonds are low in saturated fat and contain many nutrients including calcium and magnesium for strong bones and vitamin E which may help protect against cardiovascular disease and cancer. The health benefits of Coconut include beneficial effects on cardiovascular health and immune function. Dates are rich in vitamins and minerals including calcium, iron, potassium, phosphorous, manganese, copper and magnesium. Dates help in fighting constipation, intestinal disorders, weight gain, heart problems, diarrhoea and abdominal cancer. The fibre contained in apples reduces cholesterol by preventing reabsorption, and (like most fruits and vegetables) they are bulky for their caloric content. This is also a great breakfast for those that have a gluten free diet. I just throw in 1 apple quartered, two pitted dates (make sure you buy fresh dates and not the dried sort which usually have added preservatives), a small handful of almonds and a sprinkling of shredded organic coconut. Pulse on turbo for 1 – 2 seconds in your thermomix and you are done! Top it with some natural yoghurt and this breaky should keep you full until lunchtime. I quite often make this recipe for the week and keep it in the fridge with the yoghurt already added. The apple goes a little brown but it doesn’t affect the taste. ← Who doesn’t like chocolate? Hi Emma, this sounds great as I’m GF. If you don’t have a thermomix can you just use a food processor? 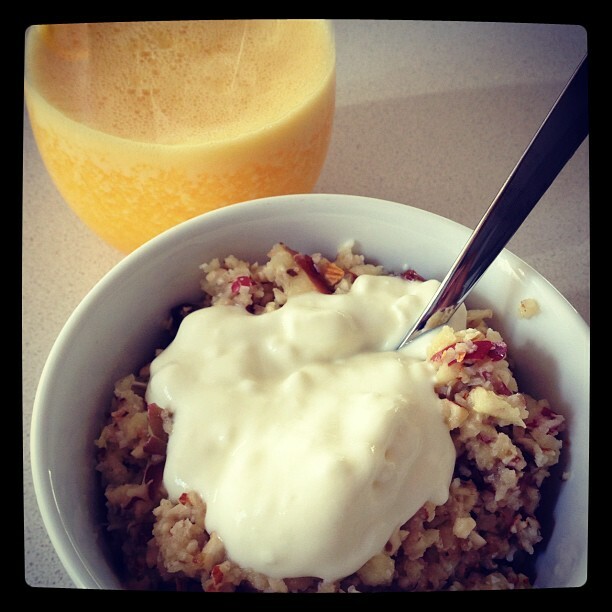 I would love th GF muesli recipe if you could please PM it to me.